Sharp EL334FB Desktop calculator. Desktop calculator with LCD display. Double zero key. Smart looking calculator with a 10-digit angled display. Grand Total function. Since the introduction of the first electronic desktop calculator, Sharp has led the way in the field of calculator technology. 8 digit display. Change sign key. Computer Accessories. Office Machines. The Casio EL334FB is a smart and sturdy twin powered calculator that will take being knocked about in your bag. The keypad is colour coded for ease of use and the calculator has a large, readable 10-digit angled display. Uses Sharp's COS (Crystal On Substrate) technology. 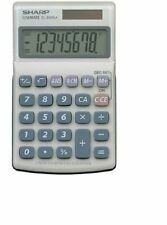 This battery operated scientific calculator features up to 272 scientific and statistical functions. Up to 272 scientific and statistical functions. Features substitution calculation. Multi-line playback. 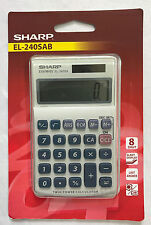 Sharp Calculator LE-531THB-WH Brand New . Condition is New. Sharp EL-520V Advanced D.A.L. Twin Scientific Calculator solar & battery GCSE. Condition is Used. Dispatched with Royal Mail 1st Class Large Letter. Good calculator, includes graphing and data functions. Entering and showing results as done in a text book. Power source: 1 x battery (LR44). 4 user defined keys for multi-purpose functions. Sharp EL-124AT Desktop calculator. Desktop digital calculator. Tilted display minimises glare on desktop. Grand Total function. Din Rail Connectors. Maths, Humanities & PE. 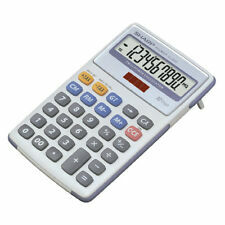 The Sharp EL-2125C is a desktop calculator with large, tilting 12-digit LCD display. Sharp type EL-2125C. Computer Cable Assemblies. Double-zero key. Ribbon & Flat Cables. 96x32 dot matrix LCD. 4 user defined keys D1-D4 for direct access of often used functions (short cut keys). Entering and showing results as done in a text book. Manufacturer: Sharp Electronics (UK) Ltd.
Good working order. Postal insurance included as standard. Sharp EL-531GH 10 Digit Display Scientific Calculator. SHARP COMPET 225 SHARP CS225 ELECTRONIC DESKTOP CALCULATOR. GENERAL INFORMATION. SOLD AS DESCRIBED AND AS PICTURED. REAL ITEM PHOTOS. Keep a record of your workings with a Sharp printing calculator. A solid, attractive machine with a clear 12 digit display, this is a robust and practical addition to your desktop. Printing in 2 colours at an impressive 4.3 lines per second, it is a great aid when completing complex calculations. 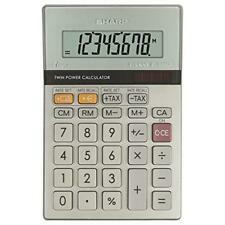 This Sharp Pocket Calculator EL240SAB has a large display and anti-scratch coating. Item model number: EL240SAB. Printing : No. Printing Functionality : No. Design : Handheld Calculator. Type : Handheld Calculator. Printing Functionality : No. Semi-desktop calculator with 'glass top' design. 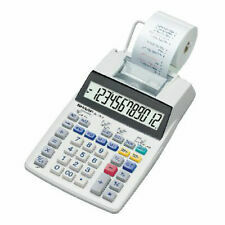 Type : Professional / Desk Display Calculator. Percent key. Angle display. Tilted Display : No. Change sign ( /-). Item model number: EL330ERB. Sharp EL-531XB-YR School Scientific Calculator. Sin, Cos, Tan, Et Inverse. Last answer recall. Last digit correction. Random Integer. Random Coin. Random Dice. Permutation Et Combination. Sharp Compet. Electronic Calculator. Model CS-6301A. 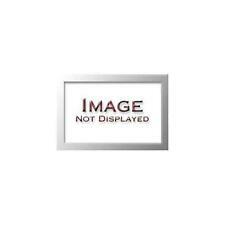 Sharp EL310ANWH Desktop Calculatorbr Dual Poweredbr 8 digit LCD display 60 x 18mmbr Slant display fo. 8 digit display. Dual Power: solar and battery. Tilt Display. Product Details & Features. Fully working solar calculator. In good condition. In good working condition. Decimal selector is missing it's fitting but can still be used with ease. OEM EL2607PGY. 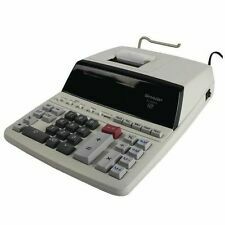 Robust desktop calculator with 12-digit fluorescent screen. Decimal Selector Yes. Keep a record of your workings with a Sharp printing calculator. A solid, attractive machine with a clear 12 digit display, this is a robust and practical addition to your desktop. This is used but in good condition. There is slight signs of use but nothing serious. It is a wonderful design with its original folding cover. As shown there are a few light marks and scuffs to the case with a touch of dust from storage. There are also a few light marks to the device itself and the peeling to the edge of the inside of the spine as shown in close up. 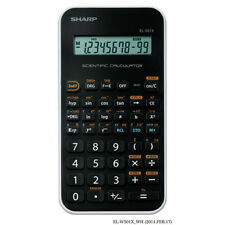 Sharp EL-W506T Advanced Solar Scientific Calculator. 96×32 dot matrix LCD. 4 user defined keys D1-D4 for direct access of often used functions (short cut keys). Suitable for A-level with Binomial and Normal distributions calculations.